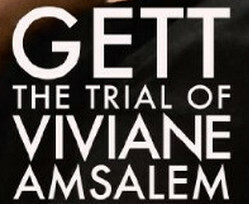 Disturbing and shocking, "Gett: The Trial of Viviane Amsalem" is a fiction about an unimaginable fact of life in present-day Israel. The divorce-centered drama is so provocative it's become a lightning rod for debate inside the country. Even watching from a distance is unnerving. For all intents and purposes, Viviane (Ronit Elkabetz), a wife and mother, is chattel. No rights to speak of, no voice or choice in her desire to end her long-dead marriage. Her only hope rests in the hands of rigid rabbis and a resistant husband, Elisha (Simon Abkarian), neither inclined to grant her request. As we learn through the course of the trial in which she presses the rabbinical court to overrule her husband and grant her a divorce, there is no other avenue open to her, no civil court procedure to end a marriage. As it is, her decision to live separately from her husband has branded her as surely as that scarlet letter did Hester Prynne. For Viviane, though, there have been no indiscretions. The tense courtroom drama stands as a film on its own, but it is also the final part of a trilogy written and directed by the Elkabetz siblings, Ronit and her brother Shlomi. In 2004's "To Take a Wife," Viviane was a young mother, but her marriage to Elisha already was stressed. In the next film, 2008's "7 Days," we watched the family sit shiva as more conflict emerged. "Gett" is the most pointed and most moving as it follows Viviane as she brings her case before the court. Years pass, with Elisha and the various rabbis who sit in judgment refusing her. Though divorce is never easy, never without cost, watching Viviane quietly resist the patriarchal system that keeps her tied to her husband against her will is both empowering and depressing. Empowering because the filmmaking actress imbues her with such determination, even when it would seem that she is worn to the breaking point by the process. Depressing that this system exists. Watching what unfolds in the courtroom, you understand the film's title. Viviane, who brought the case, is as much on trial as Israel's divorce policy. The process favors the husband; only he can agree. He has the tacit support of the rabbis who run the proceedings. They could choose to overrule Elisha, demand he grant his wife what she is asking. They choose to first turn a blind eye; they hide behind tradition. When, near the end, Viviane nearly screams at them — but what about me? — it throws the courtroom into chaos. These men are not used to being defied. Most of the action unfolds in that bare-bones room so tight it immediately creates a claustrophobic effect. The rabbis sit above it all on a raised platform. The tables for the aggrieved parties and their attorneys are small. Director of photography Jeanne Lapoirie's camera shoots most scenes from the point of view of the character speaking or being questioned. So you don't see Viviane unless her husband glances her way or an irritated rabbi stops to admonish her for continuing the case long after they've grown weary of it. The only times the film moves out of that prison-like space is to capture the moments in the tight confines of the waiting room. In a meticulous fashion, the story takes apart the current process piece by piece. The attorneys' arguments lay out the legal and religious question. There is a parade of witnesses — family, friends, neighbors, members of their synagogue. Title cards announce how many months, then years have passed since the last hearing. What is fascinating is that Viviane refuses to go away, much to everyone's chagrin. As the evidence against continuing the marriage stacks up — the years Elisha has gone without touching his wife or talking to her, the way he isolated her from her family and friends — it becomes excruciating to watch. That Elisha, who at one point is sent to jail for contempt, is still backed by the rabbis each time he denies Viviane's court pleadings becomes an outrage. Rarely is Viviane allowed a word, which makes Elkabetz's ability to telegraph what she is feeling with a look all the more remarkable. Elisha also rarely speaks so the couple's lives and their relationship are mostly dissected by others. Surprisingly, there are light moments scattered throughout, usually in the testimony of some outspoken witness. But the dark reality of Viviane's plight, and the plight of all women seeking a divorce in the country, is impossible to forget. The tragedy here is not a single story but that a process so inequitable and so inane continues in a place that is considered to be enlightened. "Gett," in moving and infuriating ways, exposes a very bleak corner of that world.